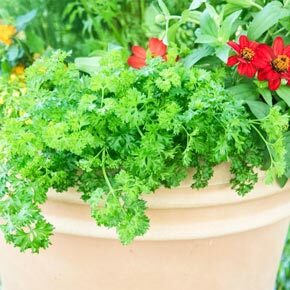 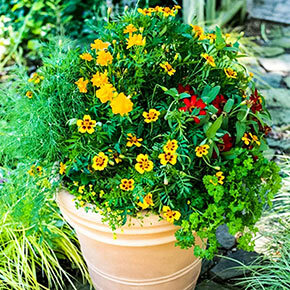 With parsley and dill for you to nibble, as well as other proven pollinator attractors for butterflies to enjoy, this powerful collection of hot colors packs a punch in a sunny patio pot. One of our exciting new Glenwood Annual Collections, choose this one if vibrant color is your thing. 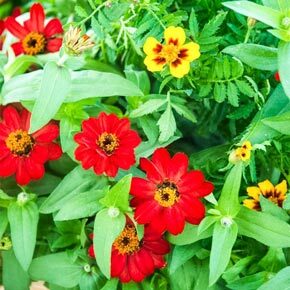 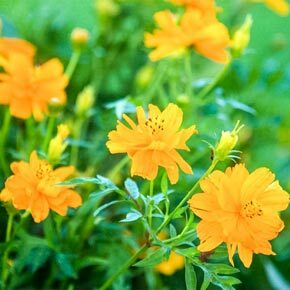 The aggressive nature of the cosmos, lantana and marigolds may require some pinching back as they get started, but it also ensures that you'll have a full and floriferous display before midsummer. 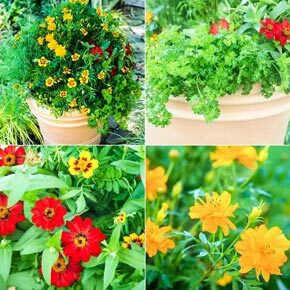 Collection contains one each (enough for a 14-16" pot) of: Fernleaf Dill, Profusion Red Zinnia, Bandito™ Red Lantana, Dwarf Jaguar Marigold, Mecardonia, Curly Parsley.